Hey peeps! I know, it’s been forever since we’ve talked about the flip! I’m here to remedy that with a little sneak peek at what we have in store for the flip’s two bathrooms. Neither one is particularly large so we can afford to get a little spendy with the finishes – carrera marble for everyone! We’re keeping the existing layouts for both bathrooms, with two exceptions – we’re expanding the shower in the master bathroom and lengthening the vanity in the guest bathroom. Check this out for a little refresher as to what the bathrooms looked like when we bought the place. All of the hardware and fixtures are chrome, with a little detail that isn’t too ornate. The flooring throughout the entire bathroom will be that gorgeous carrera marble in a herringbone pattern – a tiny little mosaic that makes my heart go pitterpat. The vanity will have the cabinet profile shown above, with the lighter stain color – my hope is that having a stained vanity will warm up the space since all of the gray and white that we have going on in there could read a little cold. The rest of the space will be white white white – white walls, white subway tile with gray grout, and of course a white toilet and squared undermount sink. Looking good so far? The cabinetry in the guest bath is light gray, so we’ve chosen a pinwheel carrera marble floor tile that has black accents to break up some of the gray and white. Since the floor tile is a little more on the traditional side we’ve decided to go with hardware and a faucet that is very streamlined to balance things out. The bathtub/shower will have subway tile laid in a brick pattern with gray grout – do you love that look as much as I do? So there you have it – two modern, classic bathrooms for the ol’ flip. What do you think? This post is brought to you by Modern Bathroom, a great supplier of bathroom vanities and other bathroom décor. I LOVE the master bath. Do you mind sharing where you found the light fixtures you will be using in both baths? We still have the builder basic “Hollywood” style lights after almost 11 years. They are awful but I have never really seen anything that I have loved enough to buy. I even check overstock all the time. I am so wishy washy when it comes to light fixtures. Can I let you in on a little secret? They’re from Home Depot! I’ve loved them since we used the single-light version in our powder room 4 years ago, and we’ve used them in pretty much every flip since then. They look so great in person, I promise! Here’s the link. Hope that helps! Great article, and at risk of being cheeky can I copy Monica and ask where you found those light fixtures!? Very pretty! I love all your choices! So, you are doing carrera for the vanity? 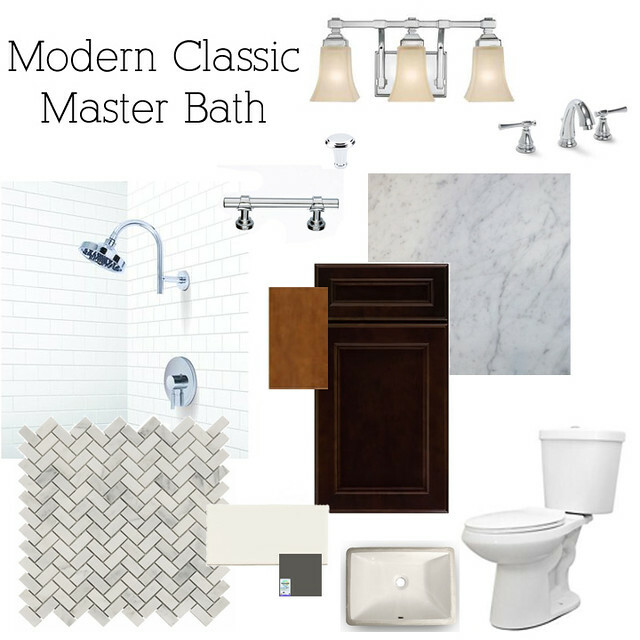 We are still in the selection process for our master bath so once again this is quite timely! You perfectly described the look I’m after. I’m trying to decide on the vanity top and really like kashmire white granite but it seems mostly used in kitchens rather than bathrooms. Do you have an opinion on whether or not it would work? It just seems like a versatile color to me as well as brightening up the space. Yes, carrera for the vanities! Fun that you’re thinking about kashmire white – are you planning to mix it with carrera, or have it be the only stone in the bathroom? I’d be a little hesitant about mixing it with carrera because kashmire white seems to have a bit of brown in the gray, but if it’s on its own with subway tile or something like that I think it would be beautiful! I love Kashmire White I used it in my kitchen with a procelin tile that looks like wood with white cabinets. Do you have any other ideas on maybe a glass tile to used with the Kashmire white because I hate the way the subway tile looks when it gets old. I think it would look awesome with a white penny round like we used in our 4th flip with Bianco Romano counters (to me they look very similar to Kashmir White). You could also try a white glass tile, like this. My preference would be to use white tiles because they won’t compete with the granite, but you could also try a very light gray, maybe like this. 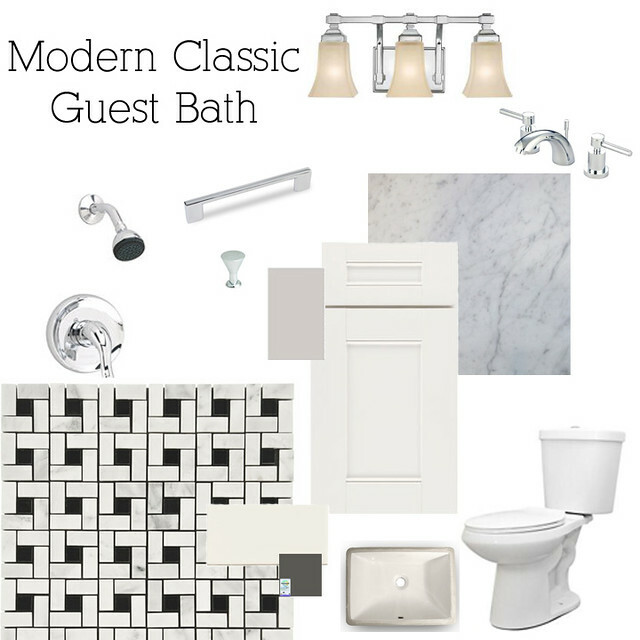 I really like your plan of guest bath and master bath. I will consider some of your points, while designing my own bathroom.